The Settle-Carlisle line is part of the national rail network with diesel train services operating between Leeds and Carlisle daily (except Christmas Day and Boxing Day). Journeys can start or end at any of the stations along the line – or you may have travelled to/from other parts of the country. A range of tickets are available (single, return, open return and advance purchase). If you are boarding the train at a manned station, you should purchase your ticket before boarding the train. You can also buy tickets in advance here. If you have purchased a ticket online, you can collect your ticket by taking details to the booking office at any manned station, or from a ticket vending machine. Alternatively, it is possible to show your e-ticket at tickets gates or to the conductor on the train. You can view our latest timetables, for both the Leeds-Settle-Carlisle and Leeds-Bentham-Morecambe routes, in the Timetables section of our website. To complement your journey, we offer an at seat refreshment trolley service on most trains. Visit our stations section for lots more about the route and local information. There are occasions when track and railway structure maintenance necessitates some of the line being closed to trains. Check out our engineering work information. You can learn about the assistance which can be provided to assist disabled and older passengers here. Wheelchairs and powered wheelchairs can be carried on trains operated by Northern. All trains have space for at least one wheelchair. For safety reasons Northern cannot take any mobility scooters on the trains unless they can be folded down before boarding and carried on like luggage. 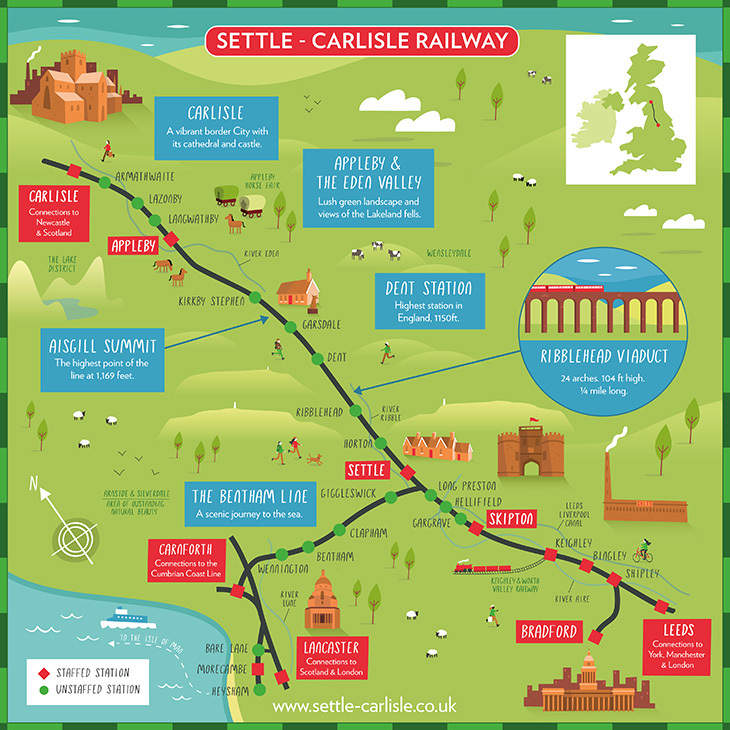 Below is an illustration of the route map for the Settle to Carlisle Railway, this also shows the stations between Lancaster and Settle, and Leeds and Settle. Please note that the route map is not to scale. You can download a PDF version of this map by clicking on this link. 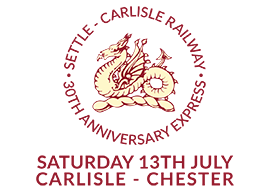 The Leeds-Settle-Carlisle line provides very useful connections for travel to/from Scotland and London at Carlisle. At Leeds there are numerous connections to/from Scotland and the rest of the country. The map below illustrates the great rail connections that are available from the Leeds-Settle-Carlisle railway.